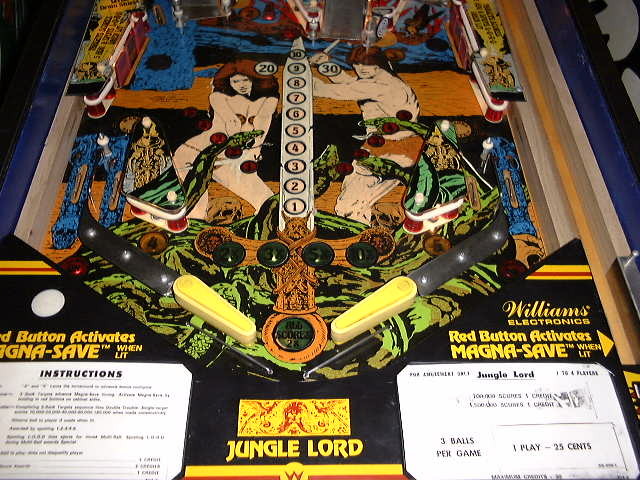 Jungle Lord is Williams' 2nd multilevel game and was released in the beginning of 1981. The game was produced in two different versions. The early sample games had a red cabinet while the production games were blue. An interesting point is that the color change effects the Backglass, Playfield, Plastics and doesn't just replace them, but the artwork is a bit different as well. Quite a change for a game that was so close to going into final production. I was told that the color was changed after Williams figured out (through testing?) that games with Red cabinets did not get played as much as games with Blue or Black cabinets. Apparently, there were about 100 sample 'red' games made. This matches with the data on the now defunct Serial Numbers Database as far as I can tell. 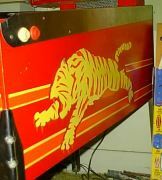 The following info was blatently stolen from the Internet Pinball Database. Another rumor about the game that I learned from Ted Estes was that apparently halfway through the development of Jungle Lord, the lead programmer quit Williams and left the software hanging. Larry DeMar had to step in and finish up the software in a hurry. 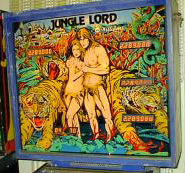 This may be the reason that Jungle Lord has an unfinished feel to the features. In my opinion, the sounds, lights and overall 'shine' of the game seems to be very simplistic in comparison to BK and Pharaoh. According to the code, there were also switches originally placed at the tops of the ramps, these must have been removed for design reasons. Red-Orange-Yellow or Blue-Red-Yellow. The stencils are very similar but are not exactly the same. (see pictures below). The easiest item to see is the streaks behind the blue tiger. Red does not have them. There are lots of other subtle differences as well so the whole stencil must have been re-designed. There seem to be two varieties here. The biggest difference is the background color and the shading color. The earlier production games (mostly red cabinets) have a yellow background with a red dot shade. The later cabinets (mostly blue ones) have a white to light blue background with a dark blue dot shade. Also, it seems as tho, there is more red in the details of the vines of the yelow backed PF while the blue backed PF has more browns. The Lamp inserts also vary, see below. NOTE: Playfields are stamped with a date, I don't know what this date means exactly but on the upper PF it appears to be on the upper left hand edge of the plywood. These are very similar in all runs. The only difference I know of is the dashed circle around the magna-save. The other version is missing this dashed circle. All other colors and the artwork are the same AFAIK. The Lamp inserts also vary, see below. NOTE: Playfields are stamped with a date, I don't know what this date means exactly but on the lower PF it appears to be on the lower front hand edge of the plywood. I guess they ran out of the translucent yellow inserts at some point and had to switch stock? 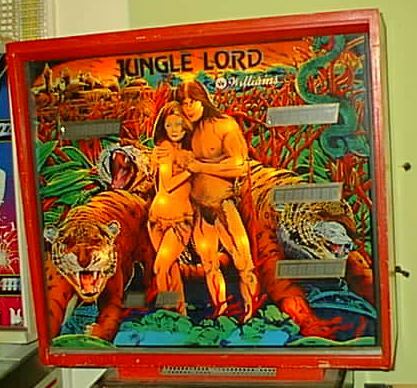 I have seen red cabinet jungle lords with white inserts and also blue cabinet games with yellow inserts. Blue cabinet games have blue on white upper pf plastics while red games have red on yellow plastics. 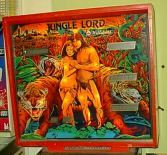 Im compiling a list of serial numbers of all Jungle Lord games to try and track down the number of red cabinets made and the variety of changes.. If you would like yours listed, drop me an email. Serial numbers are impression stamped in the wood and can be found in 3 places.. Inside the backbox frame of the cabinet - This one is only visible if the head is off. Looking at the numbers below you can see the break between the sample run and the larger production run. If you look up the serial numbers between the two groups shown here, you will find that they belong to late production Black Knight games which makes sense. Using the numbers below we can guess there there were at least 181 samples and about 5,500 normal production games. As this list grows, we should be able to analyze the numbers more accurately. From Serial # Database 467240 ? ? ? ? ? ? Dale Rice 467306 Red Yellow-Red No Circles Yellow/Amber Yellow ? Keith Apgar 467314 Red Yellow-Red Circles Yellow/Amber ? ? Ron Hettrick 467400 Red Yellow-Red ? ? Yellow ? From Serial # Database 485807 ? ? ? ? ? ? From Serial # Database 489104 ? ? ? ? ? ? From Serial # Database 489574 ? ? ? ? ? ? From Serial # Database 489584 ? ? ? ? ? ? From Serial # Database 489717 ? ? ? ? ? ? From Serial # Database 489905 ? ? ? ? ? ? From Serial # Database 490222 ? ? ? ? ? ? From Serial # Database 490249 ? ? ? ? ? ? From Serial # Database 490752 ? ? ? ? ? ? From Serial # Database 495533 ? ? ? ? ? ? 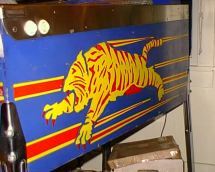 This section is a direct include from The Internet Pinball Serial Number Database, it allows me to show all current serial numbers from the IPSND directly in my site... pretty cool ehhh? 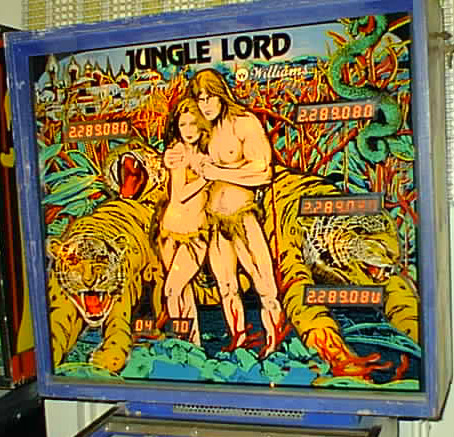 The Playfield of JL is fairly straightforward. It has two levels. The lower and upper levels are split straight across the middle of the game with 3 ramps attaching the two. The upper level drain ramps are directly on the left, center and side of the two standard size upper level flippers. 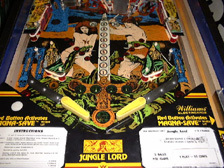 On the extreme upper left of the PF is a mini-playfield consisting of 4 lanes(L-O-R-D) in which a machine controlled kicker shoots a small (3/4") ball. This mini-field is completely seperate from the rest of the playing area and the regular sized pinballs never enter it. On the left wall of the upper PF, right above the left ramp down, is a #1 spot target. Around at the very top of the PF is a bank of 5 drop targets. To the right of them is a kickout hole tucked way back in the upper right corner. Following back down around the upper right of the PF is the ball entry point which leads to the right flipper. There is a small gap between the ball entry gate and the flipper is the top of the right ramp. Jammed in right at the top is another kickout hole. Because of the placement of this hole right at the top of the ramp, it can be a difficult shot to make from the lower PF. Williams attempted to make a metal bracket to force the ball into the hole, but it doesn't work most of the time. The lower PF is pretty standard... Flippers, Slingshots, Inlanes and Outlanes in regular fashion for the time. There is a magna-save above each inlane (see below for magna-rules). Above each outlane is a bank of 3 drop targets running vertical. Around and behind the left ramp is the U-turn. Notice the #2 at the left side of U-turn entrance. Also, notice the #3 target on the left side of the right ramp entrance. The #4 and #5 are located on the inlane rollovers. 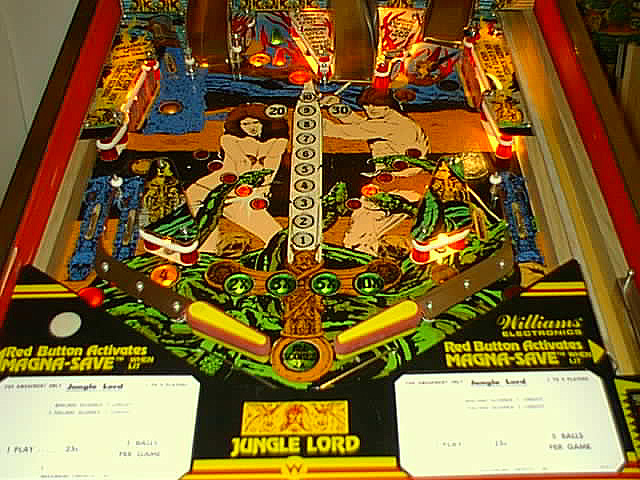 Multiball - To start multiball you first have to spell L-O-R-D. Letters for L-O-R-D can be awarded by hitting down a drop target bank in a operator adjustable time (about 7 seconds usually). Or by passing the mini-ball through the associated Mini-PF lane. The Mini-PF is activated by getting the ball in one of the two upper kickout holes. 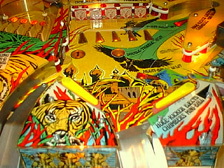 The kickout hole at the top of the right ramp may award two(2) mini kicks when lit(see below). 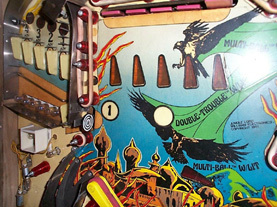 Once L-0-R-D is spelled, each kickout hole lights to start multiball. When the first ball is locked, the second is served and when the second ball goes into play, a timer (default 30 seconds) starts. If you drain during this first 30 seconds, both locks are again lit for multiball until the timer runs out. 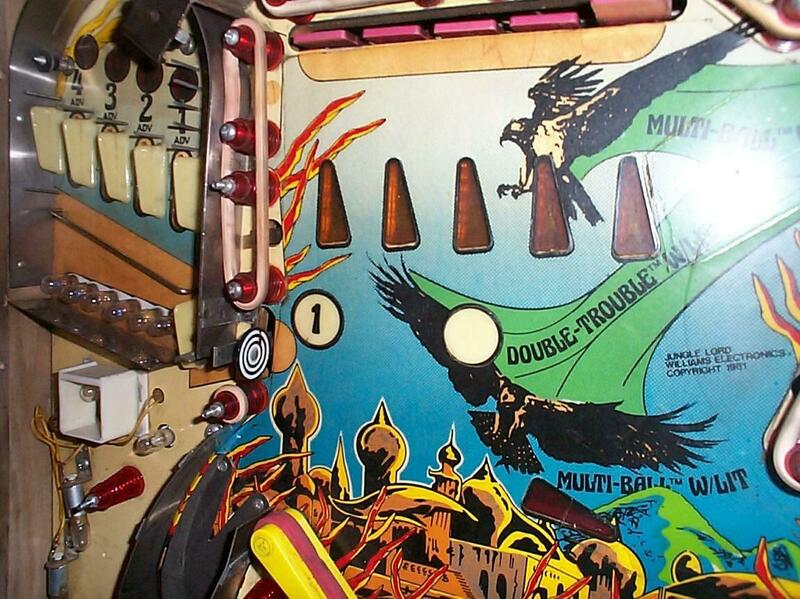 This way, you are almost guaranteed at least a 30 second multiball. Spelling L-0-R-D during multi-ball awards special. Mini-PF - The Mini-PF is one way to spell out L-O-R-D. The mini-ball is kicked when you shoot into one of the two upper PF kickout holes. During multiball, spelling L-0-R-D awards special. Double Trouble Targets - The targets at the top of the upper PF are called the double trouble targets. When a player first starts. Only one(1) target will be standing. Hitting down that target will make two(2) targets reappear. Hitting them down, the machine will pop up three(3). And so on. The goal is to get all 5 targets standing and then hit them down. This is not a timed goal, whatever targets are still standing at the end of a ball, the same will pop up for the next ball. Once all 5 targets have been dropped, the Player Starts Double Trouble. During double trouble there is always only one(1) target standing. But once you hit that target down, the game will randomly reset another target. The goal is to hit down this next target within a predetermined amount of time (usually 5 seconds). These targets each progressively score.. 10,000-20,000-40,000-80,000-160,000 points. This really adds up quick, especially if you have 2X scores lit! (see below). Magna-Saves - These are pretty straighforward. Every drop target on the lower PF earns you a magna-save on the same side as the target. You ca have up to five(5) magna-saves per side at one time. When the magna-save buttons are pushed, the magnet is pulsed on for as long as you hold down the button or until you run out of magna-save units. Magna-save units last about 1 second if the button is held down. Double Scores - This is pretty straightforward. Hitting the 1-2-3 targets and the 4-5 rollovers(left and right inlanes) lights double scores for the remainder of the ball. All PF scores are multiplied by 2, even your end bonus. Multipliers - When the ball goes down either inlane, it flashes the U-turn for 5 seconds to advance multiplier 2X-3X-5X-10X. Once 10X is reached, the inlanes light the U-turn to award a 'Drain Shield'(see below). Once both Drain Shields are lit, the U-Turn when lit awards points. Also, shooting the ball through the U-turn backwards (a much harder shot), instantly and always awards a Drain Shield. Drain Shields - There is a lamp in each outlane called a Drain Shield. When it is lit and the ball drains via that outlane. The PF goes dark for a second and you get your ball back. Huray! When only one Drain Shiel is lit, it will alternate between the two outlanes with the 10 point switches. While the basic idea is exactly the same. The prints are a bit different up close. But the blue tiger runs faster! Except for the possible circles around the magna-saves and the different insert option. Written by Jess M. Askey, 2000. Please email(above) with any additions or corrections.